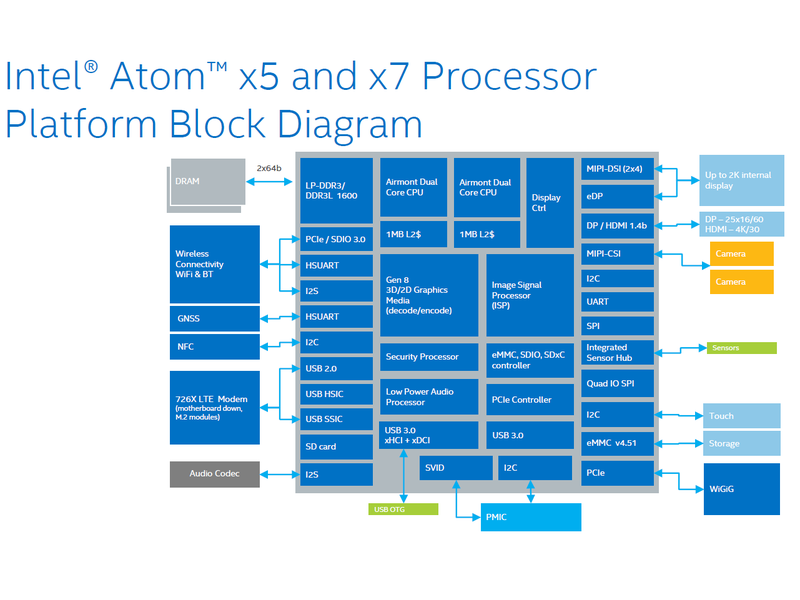 The Intel Atom x7-Z8700 is a power efficient quad-core SoC for Windows and Android devices (tablets and convertibles), which has been presented in March 2015. It is clocked at 1.6 - 2.4 GHz and part of the Cherry Trail platform. Thanks to its new 14 nanometer low-power process (P1273) with tri-gate transistors, energy efficiency has been significantly improved compared to its predecessor Bay Trail-T (e.g. Atom Z3795). In addition to the CPU cores, the SoC offers a DirectX 11.2-capable GPU as well as a LPDDR3 Memory Controller (2x 64 bit, 25.6 GB/s). The processor cores are based on the Airmont architecture, which is basically a slightly modified shrink of the previous Silvermont core. While performance per clock has not been improved, the more efficient 14 nm process leads to a better utilization of the CPU Burst (alias Turbo Boost) and a therefore somewhat higher overall performance. Compared to the Atom Z3795, the Atom x7-Z8700 offers about 5 percent more performance and is similar fast as an AMD A6-6210 APU or high-end ARM SoCs, e.g. the Snapdragon 810 or Exynos 7420. Using Windows, the performance is adequate for everyday tasks such as Internet or Office, but not for very complex software or modern games. The HD Graphics (Cherry Trail) is based on the Intel Gen8 architecture, which supports DirectX 11.2 and is also found in the Broadwell series (e.g. HD Graphics 5300). With 16 EUs (Execution Units) and a clock speed of up to 600 MHz, the GPU is about twice as fast as the HD Graphics (Bay Trail) and will handle older and less demandig Windows games (e.g. Counter-Strike: GO) in low settings at decent frame rates. The GPU also supports 4K/H.265 video acceleration. Compared to ARM SoCs, the HD Graphics offers a performance somewhere between the Qualcomm Adreno 330 / PowerVR G6430 and the Adreno 420 / PowerVR GX6450.